8 Plait, 8 Brait, 8 Braid, Multiplait, that plated stuff and a few others are common terms for a rope that's in the Square Braid family. Made to our specufucation in conjunction with some winch makers. The plan was to make the best of the best in it's class to give the user the best performing, longest lasting and stongest rope available. The plan worked. This particular braid is made from T66 raw yarn. This features very high thermal stability, which is a very good thing. Due to the high tenacity raw product used and the very high quality level of manufacturing this braid is considerably stonger than the others. The high quality raw yarn give this braid very smooth and consistant elongation, just what you need to give a smooth ride and decrease those nasty shock lods on the associated gear. This braid is also fully Certified, the only one that is. These extra layers of quality checking give assurance the braid is made to the very high specification required. 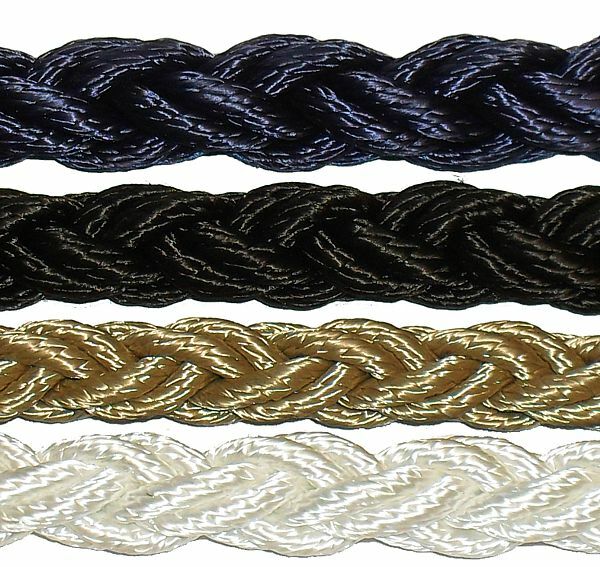 If you're after NZ's most popular and well proven braid, you've just found it. Nylon 8 Braid Anchor rope. Square Braid is a common name for this braid as the 8 braid construction ..